There are times when it seems that all I consume are smoothies. So I decided to keep up with my recipes and share them with you my athletes and readers. One of my favorite “cheat” snacks is peanut butter cups so I have created a smoothie that comes pretty close to tasting like my favorite indulgence! Endurance athletes LOVE to eat. I often hear this is why various athletes took up cycling and running just so they could eat more. However what if the foods you were eating not only tasted good but provided performance and recovery benefits? I consume at least one smoothie a day and while I have several go to favorite recipes I have also been concocting some new ones and I thought I would share with you a recipe a month this year! All recipes will use a Magic Bullet blender. Why Magic Bullet blenders? It’s the one I use and I find that it is very easy to control the amounts of calories I consume! To learn more about the Magic Bullet check out their website. When it comes to my ingredients I am a creature of habit. I use NutraBio.com Concentrated Whey Protein and Aminos, Nature’s Way and Spectrum Organic, Extra Virgin Coconut Oil. Any other items listed in future articles I will call out but more than likely they too will be organic or come with a GMP Certification. Some smoothies I think just taste better with milk and not yogurt or just using water. If you are lactose intolerant try the mix with Almond or Rice Milk instead. Why not Soy Milk? I am not a fan as I don’t care for the taste and have read enough studies that I am not 100% sure I think Soy and Soy Isolates are safe. Check out this article and it’s myriad of sources and make the decision for yourself. Note, I am not sponsored by any of the manufacturers or supplement makers listed in these recipe posts. However GU Energy does sponsor me. Need an extra pick me up in the AM add a little coffee to the mix just make sure it isn’t hot or it will curdle the whey! 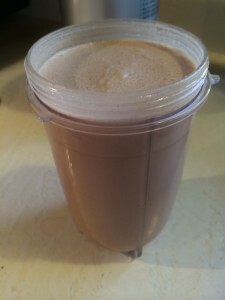 This is one of my go to smoothies for breakfast when I am getting tired of berries and other fruit based smoothies. Caution must be used if you are sensitive to caffeine in the evenings as cocoa could keep you awake longer than you would like in the evenings. I hear the argument all the time that if YOU eat the right foods you do not need to supplement. Tell this to an athlete who trains between 8 and 30 hours a week! While I do not make a habit of recommending lots of supplements to those that I coach I will say hands down Whey Protein is a must. However not all whey proteins are the same and this is why I have chosen NurtraBio’s. Their Whey Concentrate in non-denatured. “It is protein from whey that has not been denatured. This means that the protein must be processed in such a way that harmful organisms are destroyed, but the heat sensitive amino acids that make it bioactive, called branched chain amino acids, are not harmed. It has not been pasteurized, but processed at a lower temperature than traditional pasteurization in order to preserve the amino acids that are thermolabile, or destroyed by high heat. In next month’s recipe I will give you another one of my favorite recipes or maybe one of my new ones. I will also cover the details of one of the important ingredients like I did with Whey Concentrate. Feel free to share the recipe with friends.